New ideas lead to new video marketing campaigns! New animations and new information to share! For any campaign to succeed, you need to set clear goals. Planning is one of the most important parts of any marketing campaign, and developing a plan should always start with setting goals. It’s important that you set the right goals. Often, goals are either unrealistic or unchallenging. This can have a negative effect on your marketing efforts and your team’s motivation levels, as does a complete absence of targets – so make sure you get this right! A recent study revealed that approximately 80% of people don’t set goals before starting a task. Out of the 20% who do work towards goals, around 70% fail to achieve their set goals! We’re going to make sure that YOU can set realistic goals and achieve them while creating engaging Moovly animations. Having the right goals in place is crucial! 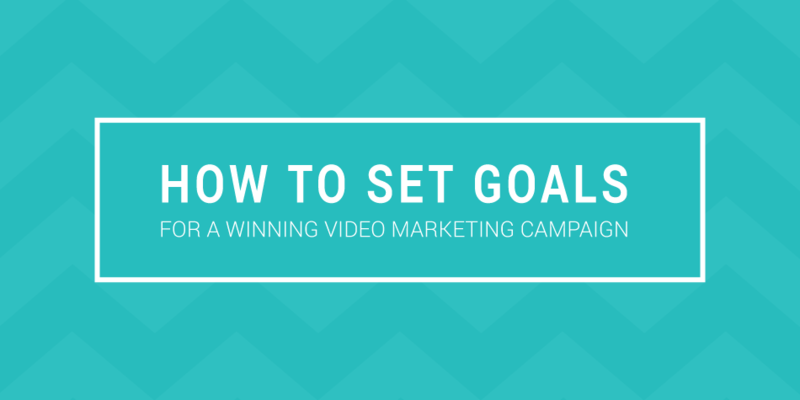 Setting goals and adhering to them is an integral part of your overall video marketing plan. Read on to find out more about the importance of setting goals, or if you’ve already got yours sorted, sign up to make your animated video. Why are goals so important in video marketing? Setting goals is a vital step in your digital marketing strategy and in particular your video animation marketing campaign. Your goals should help drive your video into one clear direction. Think of your goal as an instructor, there to provide you with guidance and motivation. Although goals vary from person to person, job to job, company to company, the purpose of a goal is consistent throughout. Your goals will provide you and your video with 3 clear benefits. Aim. You know where you are going and can see your target clearly in front of you. Without a goal, a business may advance in the wrong direction, and you could end up with a video that focuses on attracting new clientele instead of repeat clientele, which won’t match up with the rest of your campaign. Your defined goals should present a clear direction for your video campaign that is in synchronization with your advertising strategy. Coordination. Unless you’re a one man team, you all need to be working towards the same goal. Choosing or playing music that suits the theme, designing or sourcing images that visualize your thoughts and writing or recording the words that tell your story. Goals will enable different people to coordinate their efforts to create the video animation you set out to make. Measurability. Knowing what we want means we can ask all the right questions to do it better next time, to understand our strengths and conquer our weaknesses. Did your animated video reach the right audience? Does it promote your message? Did people understand the message? Did it convert? Check out some great Moovly videos for examples of clear set goals transformed into beautiful and informative video animations. When creating your video marketing campaign, take it slow, break it down and split up your work piece by piece, don’t try and tackle it all at once. In fact, be clever, and use S.M.A.R.T. goals. As we mentioned earlier, a critical reason why campaigns don’t manage to achieve their intended goals is due to their over ambitious expectations. You can have the best digital marketing strategy, a professional video maker, and an exceptional video, but without appropriate goals, you will struggle to be successful. By appropriate goals, we mean ones that are clear, challenging and engaging. For your video animation to bring in the best results, we suggest you use S.M.A.R.T. goals! What are S.M.A.R.T. you ask? They are Specific, Measurable, Attainable, Relevant & Time-bound. “Increase the traffic to our website by 20% in the first quarter” Is specific and S.M.A.R.T. Measurable. How can you measure the success of your video? Goals need to be set with measurable KPIs that will allow you clearly identify your performance about your target. How many views? By what % has our web traffic changed? Attainable. Are the goals set realistic? Can you use past video marketing campaigns as an example? Be fair and realistic with your expectations and learn from each campaign. Don’t stretch it too far, but don’t make it too easy either. Understand your audience and the patterns in your industry to create realistic goals. Relevant. Does growing your brand awareness support your overall business objectives and values? Are you using your video to attract the right people (your target audience) to your website? Your online video goals need to be in line with your overall marketing strategy objectives. Time-Bound. Your goal should be grounded within a definite time frame. Clearly, illustrate that your online video should aim to reach X number of views by a certain date which should convert to Y website views and Z new registrations or sales. If your goal does not have a start nor an end, then it simply can not be viewed as specific, measurable or attainable. Have you already got S.M.A.R.T goals in place? Sign up for your Moovly business license to create company branded videos with our cloud-based video animation software. Goals are unique to every marketing campaign. Effective goals are incredibly tailored, not just to your business, but to your past marketing efforts. Nonetheless, to help make sure your goals are clear and help measure your ROI, we have created a checklist that you may find useful when setting your video campaign goals. The objectives of this video campaign have been clarified. The campaign goals have been understood and clearly communicated. KPIs to determine the success of this campaign have been selected. The tools and ability to evaluate/calculate these KPIs are available. The team involved has the skills to achieve the campaign’s goals. The focused target audience has been defined and researched. Campaign goals are consistent with and contributing to top-level goals. A clear time frame for this campaign has been defined. Determine your goals before getting started on your video content. Your goals should dictate the overall direction of your video and not the other way round. Keep your audience in mind. Ensure that the video is designed to appeal to the target audience and give them valuable content. Now that we’ve outlined how to get your goals take some time to sit down and establish your video campaign goals that will benchmark this year as your best. Remember your goals are there to guide you, so make sure they are S.M.A.R.T. and don’t be afraid to challenge yourself. Once your video goals are in place, then it’s time to get started on your awesome video animation, and what better way than with Moovly.